Special Olympian Jeff Robinson participates in the running long jump at the annual track meet. Athletes were assisted by the 160 peer tutors from both Marshall County high schools, Cameron and John Marshall, while competing in various track and field events. Participants could also make arts and crafts or take silly pictures in a photo booth. Several JM Career & Technical Education programs helped at Special Olympics. Agriculture students prepared and set up the field for the event. Nursing students in the Therapeutic Services program provided a first aid station and assisted with physicals. JM Pro Start students prepared lunch while WJMH Media students announced results and played music. 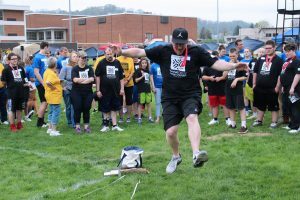 The Knights of Pythias, American Legion and Army National Guard also lent a helping hand during the Marshall County Special Olympics Spring Games. Everyone received a t-shirt donated by Main Street bank. This years’ theme was Star Wars.